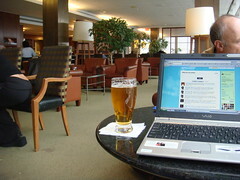 Well, seeing that I was talking about airport lounges today, thought I’d write a quick note from the Maple Leaf Lounge in the domestic terminal in Vancouver, British Columbia where I’m current enjoying a beer and Ed is munching on chips. 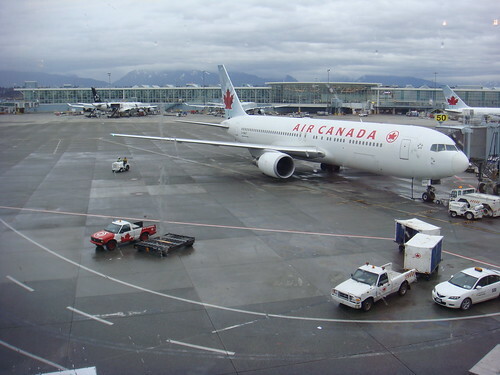 Other than the fact that we’re now only an hour away from our home in Penticton (and my oh so precious kitty that I haven’t seen in 2 weeks), I like the Vancouver airport lounges better because the view is much better… MUCH. OK, the pic below doesn’t exactly show Vancouver’s north shore mountains in all their majestic glory because the ceiling is low, but hey, it’s a whole lot better than looking at Highway 401 in Toronto.